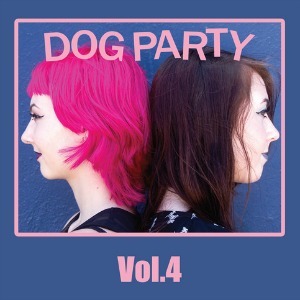 Sacramento punk duo Gwen and Lucy Giles return for a 4th go round as Dog Party. With the sisters now firmly entrenched in college and high school, respectively, they’ve managed to carve out a schedule to keep doing shows. Being apart certainly hasn’t impacted their band telepathy. With a European tour under their belts and opening slots ranging from Agent Orange to Shannon and the Clams, Vol. 4 picks up where last year’s Lost Control left off, brashly assured melodic punk jams with more bittersweet themes creeping in. Engineered by Chris Woodhouse at The Dock, Vol. 4 charges out of the gates with its opening trio of tracks. “Dead Guy,” “Peanut Butter Dream,” and “Be My Friend” set the tone with a confident churn, and that consistency shines throughout. There’s no real down point or lull in the album. “Forget” is the gem, maximizing their harmonies to a tough, staggered beat that’s totally intoxicating, a punked out Martha and the Vandellas, if you will. “Operation #2” and “Space Invader” retain their ability to fire up mosh pits at the drop of a hat. Instrumental “G Diddly” brings the party to a close, summoning up the ghost of “EPA” from their self-titled debut and underlining the fact that, even four records in, for Dog Party, the journey is only just beginning.